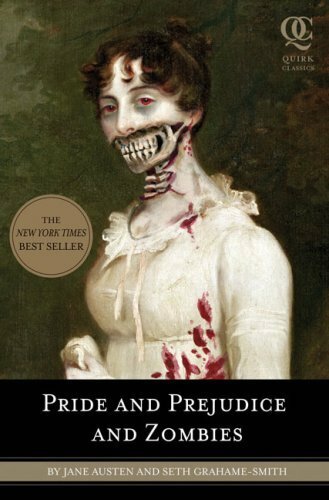 The entire Pride and Prejudice and Zombies novel can be summed up in one word: GENIUS. The entire premise of it might make some people skeptical to read it, but I dove into it head first, anticipating a humorous and very interesting new take of Jane Austen’s classic. I sure as hell was not disappointed. Seth Grahame-Smith managed to stick very closely to the original, while still making it his own. I’ve read about 3/4ths of Pride and Prejudice, and, for the most part, it was very spot on. I think people take this book too seriously, and judge it quite harshly. But you have to take it for what it is: a zombie filled parody! The zombies added a whole other element to the book. It wasn’t simply just copy and paste the original, and then add in a zombie here or there. No, this affected the whole novel; plot, characters, conversations, actions, etc. I really give Seth a hand for pulling it off. This could have gone terrible in so many ways, but he really made it work. The book also features black and white drawings of the scenes throughout the book. It was a nice surprise when I would just turn the page and find one there. It really helped bring the story and characters to life, especially seeing things like the girls in action fighting against zombies. My favorite was of the zombies eating the cooking staff’s brains… but, you’ll see that for yourself. The cover for this is certainly eye catching as well. I mean, if that doesn’t make you the least bit curious, what will? I laughed, I gasped, I wanted to throw the book against the wall, but in the end, I loved it. It was one amazing zombie thrillride! I leave you with these final words: TEAM DARCY!! I give this novel 5 out of 5 stars. I'm looking forward to reading this! I have not read Pride and Prejudice... do you reccomend reading it first or is it good on it's own?